Dublin's High Court has heard that a legal action taken by an alleged victim of former priest Fr Brendan Smyth has been settled with Armagh archdiocese. Brendan Boland claims he was abused by Fr Smyth over a three-year period. The terms of the settlement have not been made public. In 1975 Mr Boland's allegations were the subject of a canonical enquiry. Cardinal Sean Brady, who was then a priest and full-time teacher at St Patrick's College, Cavan, took notes during Mr Boland's interview. After Mr Boland gave his statement to Cardinal Brady and two other priests, he was sworn to secrecy. In a written statement, Mr Boland criticised the cardinal for refusing to publicly acknowledge and accept the failings of the Catholic Church in its handling of allegations of abuse against Fr Smyth. He said he was 12 years old when the abuse started and confided in a young priest who brought the matter to the attention of the Church authorities who convened an ecclesiastical court. "While my father was in the building, he was not allowed into the room," he said. "I was subsequently required to swear an oath which was written down." Mr Boland said that afterwards his parents, who he described as "God fearing people", were assured that Fr Brendan Smyth would not be allowed to associate with young boys or girls and that there would be no recurrence of the abuse. However, the cardinal has offered to meet him and apologise in person or in writing. During a St Patrick's Day homily in 2010, the cardinal said: "I want to say to anyone who has been hurt by any failure on my part that I apologise to you with all my heart. I also apologise to all those who feel I have let them down. Looking back I am ashamed that I have not always upheld the values that I profess and believe in." 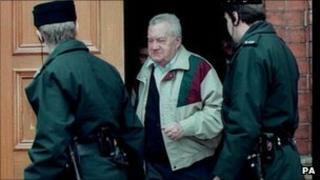 Some 20 years later Mr Boland was told of reports that Fr Smyth had abused other children subsequent to the enquiry. "I was devastated by this revelation," he said. "I felt that I had not done enough, I felt responsible for the misery of Fr Smyth's subsequent victims." Mr Boland said he attended the trial of Fr Smyth. "I met other victims who were 10-15 years younger than I who would not have been abused if the assurances given to me and my family and the youth club priest had been honoured. This un-kept promise was a further abuse of me," he said. Brendan Boland's solicitor Paul Horan spoke outside the court. "This has been a long and difficult case which was strenuously defended," he said. "The case has now been satisfactorily compromised. Our client wishes to try and put this matter behind him and he trusts that his privacy will be respected."